Pretty from the street, it's even better inside. The private entrance courtyard is bathed in all day sun, perfect for those leisurely morning coffees. 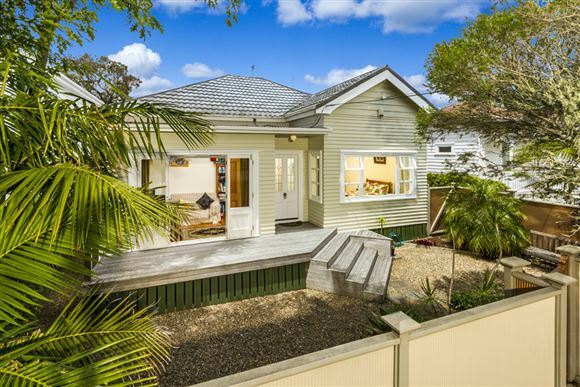 This character home offers 4 bedrooms and large high stud living areas. This quiet part of Devonport is a little known hideaway, not far from the shops & ferry wharf. The owners are moving on after twenty years, this is your chance to secure a great piece of Devonport. Chattels remaining: Blinds, Drapes, Fixed floor coverings, Light fittings, TV aerial, Curtains, Hob, oven, dishwasher, heated towel rail. Woodburner in kitchen is ornamental only.